1. In a large bowl stir together the egg white, cornstarch, 1 1/2 teaspoons of the rice wine or sherry, salt to taste and 1 1/2 teaspoons water. When you can no longer see any cornstarch add the chicken and stir together until coated. Cover the bowl and place in the refrigerator for 30 minutes. 2. Combine the remaining rice wine or sherry, the hoisin sauce, soy sauce, and sugar in a small bowl and set it near your wok. 3. Fill a medium-size saucepan with water and bring to a boil. Add 1 tablespoon of the oil and turn the heat down so that the water is at a bare simmer. Carefully add the chicken to the water, stirring so that the pieces don’t clump. Cook until the chicken turns opaque on the surface but is not cooked through, about 1 minute. Drain in a colander set over a bowl. 4. Heat a 14-inch flat-bottomed wok or 12-inch steel skillet over high heat until a drop of water evaporates within a second or two when added to the pan. Add the remaining oil by pouring it down the sides of the pan and swirling the pan, then add the garlic, ginger and chile and stir-fry for no more than 10 seconds. Add the peppers and stir-fry for 1 minute. Add the chicken, cashews and hoisin sauce mixture and salt to taste. 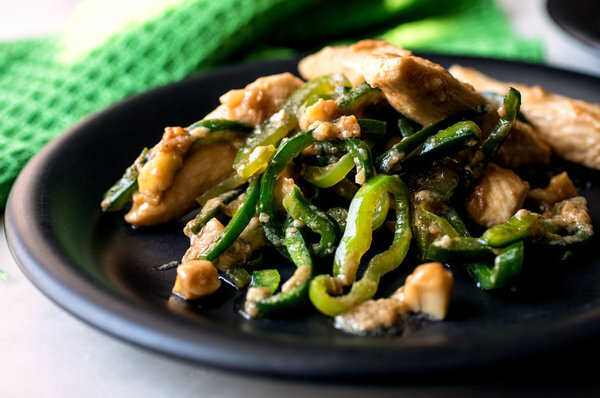 Stir-fry for 1 to 2 minutes, until the chicken is cooked through, and serve with grains or noodles.